At around 4:10 pm on Friday the 9th of November a car was driven into shops on Bourke Street in Melbourne. A man set the car on fire and proceeded to attack members of the public with a knife. He killed one man who died at the scene and injured two others. Police sought to disarm him and when that failed he was shot in the chest by police. LPG gas cylinders (the type used for BBQs) were later found in the car. The attacker was taken to hospital under police guard and later died from his injuries. The attacker was a 31 year old man who came to Australia from Somalia as a child in the 1990s. Victoria Police Chief Commissioner Graham Ashton said he was known to police and to “federal intelligence authorities” but “mainly in respect to relatives he has that are certainly persons of interest”. Media reports state that last year a relative of the man was arrested of terrorism related charges. The Chief Commissioner denied a number of claims that were spreading in social media, including the false claim that the man shouted Allahu Akbar (similar false claims circulated during the Bourke Street attack last year) and the false claims the attacker tried to decapitate people. The Chief Commissioner has said the incident is being treated as a terrorist attack. Daesh (ISIS) claimed responsibility for the attack through their Amaq news agency saying, “The one who executed the ramming and stabbing operation in Melbourne (..) is one of the fighters of Daesh and he executed the operation in response to (a call) to target the citizens of the coalition”. That call was made by Abu Bakr al-Baghdadi, leader of Daesh, in August when he called on supporters to “use bombs, knives or cars to carry out attacks”. Daesh have provided no evidence to support their claim. Our thoughts and prayers are with the victims, their families and everyone caught up in these tragic events. While we must remain strong in the face of such extremism, we must also avoid letting such events fragment our society or empower those with an agenda of hate and fear. From the evidence available this looks like a deliberate attack, planned in advance, with the intention of causing mass casualties and inciting fear. If the attacker’s intention was to advance a political, religious or ideological cause (rather than just causing mass harm for its own sake) then their actions will likely fall under the definition of a terrorist act under section 100.1 of the Criminal Code Act 1995 (Cth). With the attacker deceased this may still be important as police look to track down anyone else that may have been involved. The family and friends of the man who was killed need time and space come to grips with his death and to mourn. Those who were injured need the time and space to recover. Those who were caught up in the events or witnessed them need support as well. The police will be working hard to piece together as much of what occurred as they can, and to look for any additional background on the events that led up to the attack. Police and intelligence services, as well as researchers, will seek to examine any connections between the attacker and Daesh. There is a long history of Daesh claiming attacks that have nothing to do with them so their claim is not proof on its own. If it is a Daesh attack, there will no doubt be further efforts in Australia and elsewhere to learn from this incident and to seek to identify others who may be radicalised in Western countries in a similar way. Regardless of whether this particular incident is linked to Daesh, it is fair and reasonable for Daesh to be condemned for their terrorist acts around the world. Daesh and those who support them encourage and incite such acts of violence and that alone with worthy of our strongest condemnation. We must, however, be careful who we blame. It is neither fair nor reasonable to make generalisations about the Somali community or the Muslim community. Neither of them promote terrorism. Neither of them call for violence. The incitement to hate against Muslims is a significant problem in Australia as we at the Online Hate Prevention Institute have documented in our past work – work which has been picked up internationally and cited in the United Nations Human Rights Council. 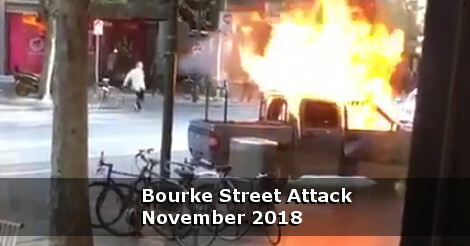 The problem is particularly acute following major attacks on the public – whether or not they are terrorist attacks and whether or not the attacker is Muslim – as we’ve documented in both the Bourke Street report and the Flinders Street report last year. We need to learn from these past incidents and the secondary threats they posed. As part of the learning effort, our findings on Bourke St and Flinders St were presented to Victoria Police in January, including recommendations to further improve the already excellent police communications during such crises. At a counter terrorism meeting with key Australian and international stakeholders at Google’s offices in Sydney in June this year we presented an idea to address the harmful incitement that occurs after a major incident. 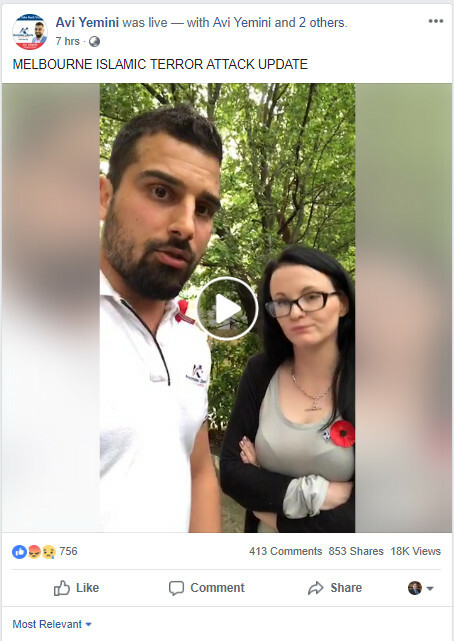 The creation of a secondary problem through incitement to violence against the Muslim community, at a time when police and other emergency services are already stretched, is absolutely the last thing they need. Unfortunately while people are scared and shaken, some will try to take advantage to foster distrust and hate. We need to recognise when this is occurring and stand up against it. We need to differentiate the legitimate analysis and condemnation of terrorist groups from attacks on parts of our own community. We need to insist media reporting is precise and there is no blurring of responsibility into generalisations against communities. We need to report incitement on social media when we see it, and call it out when it is safe to do so. Following this latest attack some are already seeking to use the tragic event to promote their own brand of fear based politics. During the Flinder’s Street incident we looked at Avi Yemini and his followers. That page of Avi’s was closed by Facebook (as was his Twitter account) but he is back with three new profiles / pages. His Avi Yemini Official page (ID 603104730091677) which was created on August 23, 2018 currently has 41,336 people following it and 37,088 people liking it. It’s continuing to grow rapidly as it recovers the followers from the page Facebook previously closed. Avi’s commentary trying to link the attack not just to Islamism as a Jihadi terror attack, but to Islam itself, seeks to blur who is responsible. He does this by relying on information that the Police Commissioner rejected as false information, the supposed shouting of Allah Ackbar. The suggestion the person was wearing “Sudanese or Somali attire” is another way to point the finger. In addition to his anti-Muslim commentary, Avi has also been actively promoting the idea of “Sudanese gangs”. This comment adds a further association between the Sudanese community and violence, it doesn’t matter that there is no basis to it. We don’t need to speculate though as Avi is very clear “Islam is 100% responsible” he tells us, and again at the end, “Islam is the threat”. This is an overt attempt to hold the entire Muslim community in Australia responsible for the action of this one person. Avid’s video 462 likes, 198 angry faces and 65 sad faces (the numbers increased even as this was being written). It was watched over 18,000 times, shared 853 times and received 413 comments. Here are a selection of the comments to this post. 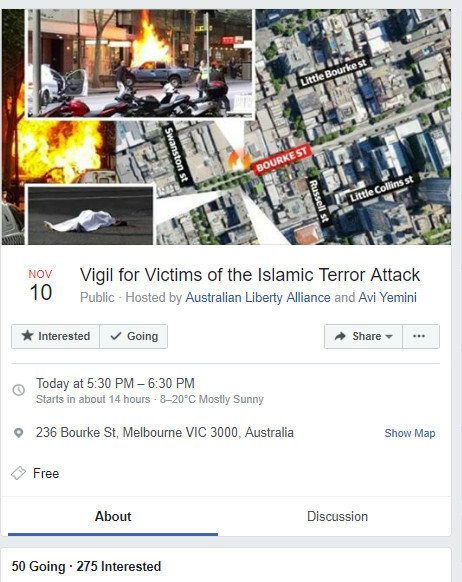 What’s really concerning, however, is after creating a space for such views and encouraging them with his own words, Avi have taken advantage of the tragedy to create an event called “Vigil for the Victims of the Islamic Terror Attack”. The last thing the police need right now is an anti-Muslim political party holding a rally to blame the Muslim community for the attack. This is either raw political opportunism (in light of the up coming election) or an effort to incite an angry mob and see what unfolds. Please help us take action by sharing this article and leaving a comment on this Facebook thread. The Online Hate Prevention Institute is a registered Australian Harm Prevention Charity. We rely on public donations to support our work. To make a donation and support out work, click here.